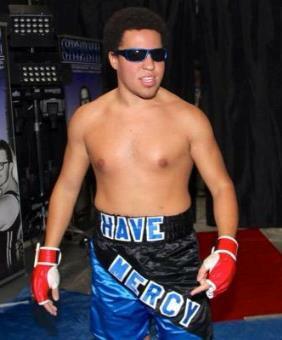 “Have Mercy” Percy Davis is a 21 year-old wrestler working out of Lafayette, Indiana. He debuted exactly two years ago in 2013 and has wrestled mostly in his home state. Some promotions Davis has worked for include IWA: Mid-South, Evolution Pro Wrestling (EPW), and Infinity Pro Wrestling (IPW). Outside of Indiana, Davis has also ventured to North Carolina where he has riled up crowds at Carolina Wrestling Federation Mid-Atlantic (CWF Mid-Atlantic). Davis trained at The School of Roc, run by veteran Indiana wrestling star, Billy Roc. Since his debut he has wrestled a lot of fellow young standouts in the area including Reed Bentley, John Wayne Murdoch, and Dale Patricks. Although Davis can execute a great spinebuster since he must have watched at least an Arn Anderson match or two, his character varies from what one would expect of a strict technician. That is because Davis plays up his persona of a bragging boxer. Think of Davis’ character as being kind of in the vein of Muhammad Ali, but intended to be more arrogant and less endearing. As can be expected of many upstarts who excel at portraying heels, Davis has eaten his fair share of pins. However, when he nails his step up corner punch finisher he can count on getting his hand raised. Paradox Pro Wrestling (PPW) is one Indiana company Percy Davis has worked for that was really able to highlight his skill. The promotion had their first show ever on August 28, 2010. While many independent wrestling companies hold big, elaborate events to celebrate their anniversaries, this promotion took a different approach. PPW Secret Wars #1 held on August 28, 2015, featured the PPW Secret Wars Tournament, performed with no audience. If Beyond Wrestling has taught independent wrestling fans anything it’s that taking the fans out of the equation is not always a bad thing. In fact since this match has such good lighting and was filmed with a quality camera it is easy to really focus on everything Davis and his first round opponent, Jake Omen do throughout the bout. The two start with a tie up, but Omen soon works on Davis’ left arm. Davis manages a hold of his own and taunts his foe by saying, “I’m too quick, I’m too slick, Jake Omen.” Without much delay Omen takes back control and works on Davis’ left arm some more, making the heel eat his words in the process. As the match nears its finish Omen is down on the ground. Davis kicks Omen in the face when Omen tries to get up. Davis then looks to jump off the turnbuckles and hit Omen with his step up corner punch finisher. However, Omen dodges it then nails Davis with a low dropkick. For the finish Omen devastates Davis with a shining wizard followed by a three count.